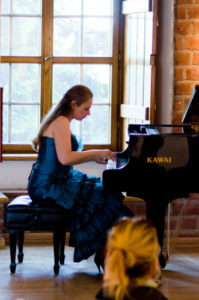 With a voucher upgrade to ChopinPASS PLUS, you will experience unique piano concert in Old Gallery of Photographers located in the side wing of the Royal Castle in Warsaw. We invite you to exceptional concerts of Chopin that are held by outstanding Polish pianists in the charming district of the Warsaw Old Town. Solo concerts take place daily at 6 pm. In a break we offer our guests a traditional Polish mead or a cold pressed juice of Polish apples. ChopinPASS PLUS includes admission to Time For Chopin Piano Concert in Warsaw (voucher is valid on a date of transfer to Zelazowa Wola, as well as one day before the transfer or one day after the transfer). Upgrade cost: 50 PLN (save 10 PLN comparing to the regular price).